A somewhat uncertain forecast for Saturday with a likely fine weather day on Sunday. A dip in the jet stream in the central US will cause a front to move through sometime in the Friday to Saturday time frame. There’s uncertainty with the timing of the frontal passage. 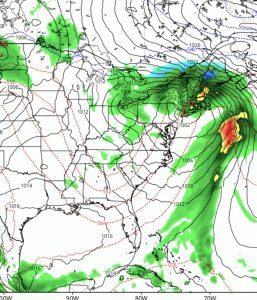 Several models show different timing and differ in developing waves of low pressure along the front Friday into Saturday. Rain likely Friday morning and Friday night into Saturday morning. It’s unclear if the waves of low pressure will move off the coast to allow clearing Saturday afternoon. High pressure builds in for Sunday. Cooler on Saturday and Sunday. Sunday 12 noon: Considerably more clouds today than had been forecast, with tonight’s low pressure system’s cloudiness already moving in. We may still see some bright spots and sun today. Yesterday, we had a dry slot allow some brightening about noon before the drizzle and light showers moved in as expected. I had hoped to get some time outside on Saturday, but it looks like the weather won’t cooperate. Those following this blog have seen the forecast change from rain through Sunday morning to rain ending late Saturday morning. Things seem to have settled on heavy rain Friday night into Saturday morning, tapering to showers late Saturday morning. Sunday will be partly cloudy/partly sunny and seasonably mild. High 58. The forecast is on track for the rain to taper and end mid to late morning on Saturday. Low level clouds remain with a chance of a light, brief sprinkle or two in the afternoon with winds shifting from easterly to west-southwesterly in the mid afternoon. 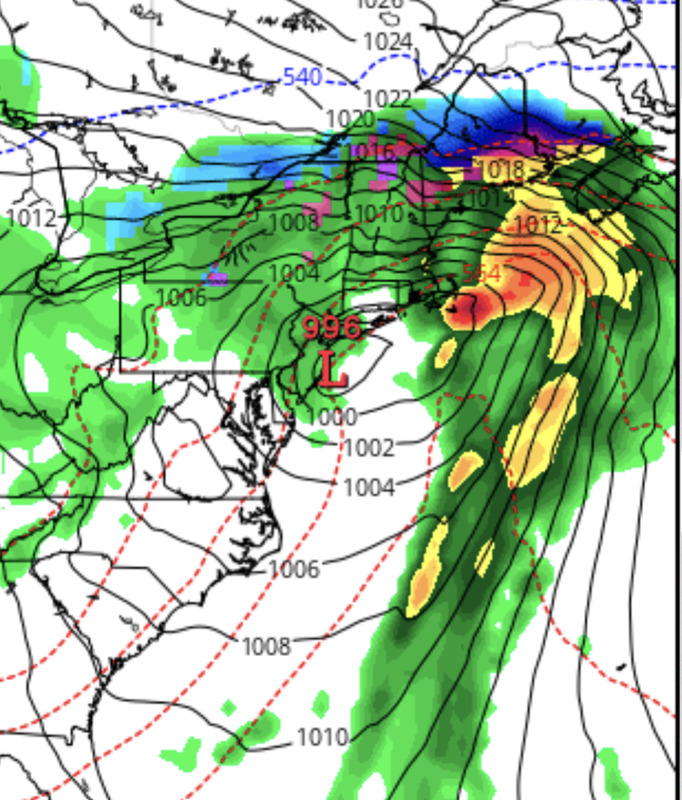 Additional Update Fri 11 AM: This morning’s NAM has the heavy rain ending by 8 AM Saturday, but continues with very low clouds and light intermittent showers for the remainder of the daytime Saturday. The NAM and National Blend of Models crank out 0.03 inches water in the late morning and 0.07 inches of water in the afternoon. Comparing the two maps in this post, you can see that the trend has been for the system to move more slowly again. Sunday still looks to be dry. Things continue to change with the forecast for this weekend. The latest GFS model shows the coastal low pressure system moving reasonably quickly, a marked change from what the models were showing just a few days ago. It appears that the rain will begin early Friday evening with the heaviest rain Friday night, ending sometime Saturday late morning. Low clouds are expected to linger through Saturday and considerable cloudiness is expected on Sunday before the second system arrives for Monday. Sunday will be unsettled but dry. As good as the models are, it’s remarkable how much a forecast can change in a matter of days. 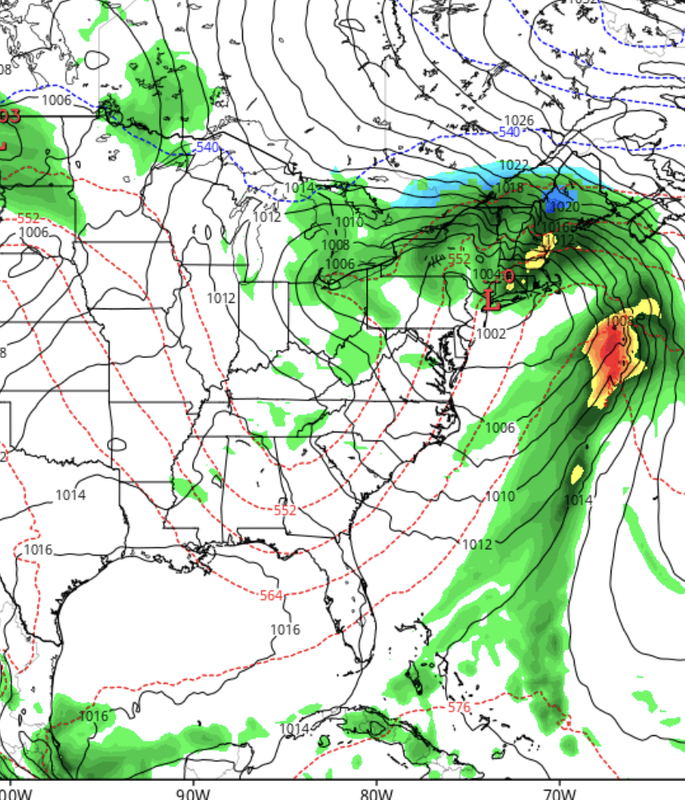 Something to remember when advance forecasts for large snowstorms end up being a bust. I’ll update the forecast Friday evening.